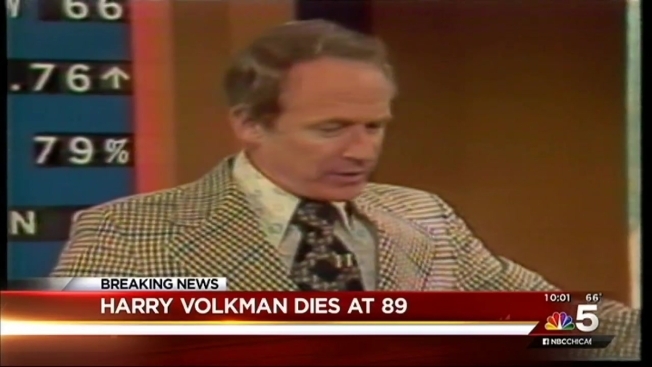 Legendary weatherman and Chicago television icon Harry Volkman has died at the age of 89. Volkman passed away Thursday surrounded by his family, family members told NBC Chicago. Volkman was a popular and beloved weatherman on four Chicago television stations, including NBC 5, for more than 50 years. One of the first television weatherman in U.S. history, Volkman was the first weatherman to issue a televised tornado warning, setting the stage for future weather warnings. He first came into the Chicago weather scene on NBC 5 in 1959, his passion for reporting the weather on full display in the Chicago blizzard of 1967. He later joined WGN, WBBM and Fox. His detailed and animated forecasts made him stand out for viewers who often recognized him for the vocal "Swoosh!" sound effect he often used. Longtime Chicagoans remember Volkman for his nightly boutineer-- a flower given to him by students at a school he visited that day. Volkman collected more than 5,000 flowers during his career. Volkman’s work earned him three local Emmys and saw him inducted into the Silver Circle of the Chicago/Midwest chapter of the National Academy of Television Arts and Sciences in 1998. He later documented his life as a weatherman in autobiography titled Whatever the Weather: My Life & Times as a TV Weatherman. By the time Volkman retired in 2004, he had weathered the Chicago climate for 54 years on TV. He is survived by his wife and four children, including longtime Chicago DJ Eddie Volkman.